A body is found near a local swimming hole and the brutality of the murder is frightening. Deputy Danny Upshaw is charged with finding the perp and closing the case. When it’s discovered the victim was gay, Ellroy brings the reader into the homophobic culture of 1950s Los Angeles while pushing Upshaw to his limit in his drive to tag the guilty party. Elsewhere, both Mal Considine and Buzz Meeks become entwined in the communist red scare. Mal is using it to his advantage in an attempt to advance his fledgling career while Buzz Meeks is shaking down unions accused of spreading red propaganda. It isn’t long until all three men are frying together in the same pan. 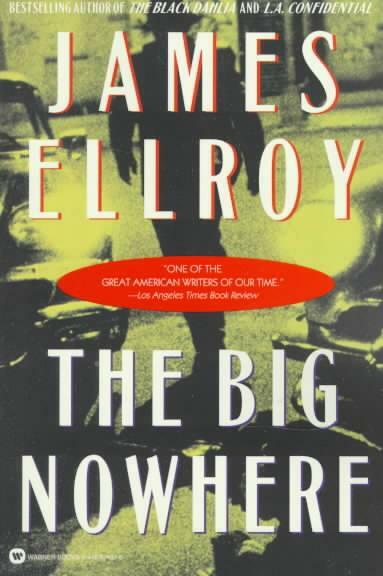 With The Big Nowhere, Ellroy was cooking with all the same ingredients used in The Black Dahlia: the seedy crime culture of 1950s L.A., snappy hard boiled dialogue, and compelling characters. So what was missing? It took me a while to pin it down but I think it eventually boils down to the narrative style. For whatever reason, I seem to prefer my crime fiction told in a first person narrative style. I’m not sure if that’s good or bad but I like to really get inside the head of the protagonist and uncover the case with him/her. I’m not saying that if a crime fiction author chooses the third person style he/she fails immediately; I just find it difficult to become fully immersed in the presented case. Why does it matter so much with this novel? I think it suffers due to my own comparisons with Dahlia and just how much I enjoyed that experience. That being said, The Big Nowhere is itself a compelling story that has everything you could want in a dark, gritty gangland tale. While in my opinion it falls short of the tremendous Black Dahlia, it shares a similar tone and fans of the first novel in the L.A Quartet series should find some enjoyment in its followup. March 4, 2014 in Fiction, James Ellroy.